Why is this site still getting views? So I have a different blog now that I am actually far more active on. I left this blog behind because I thought that I needed a new start. Is it that the tags really do work? Did I write something that registered well with people out there? Now don’t get me wrong, it’s not like I get even 20 views a day. But the fact that I still get views and my last post was over two years ago, that astounds me. Can anyone explain to me why this is? I can’t believe it, but on my first day back at writing after a summer long break I have reached a very good word count! I am incredibly happy with what I have written today and can’t wait to go back to it tomorrow to look at how I did and how I can change it! As you may know I was writing a short story that’s been on my mind for some time now. Though I didn’t realise just how short my story was going to be, I’m thrilled that I’ve finally taken to writing it down! I know I’m a bit off the 2,000 mark, but I honestly don’t mind at all! I am just so happy to have written when I was so sure I wouldn’t be ab;e to write anything at all when I got down to it. As usual there was an awful lot of procrastination and desperate attempts to throw myself down the stairs to get out of starting back into it, but now that I have I am thrilled! I would post my short story here, but as I’m not sure about how strict the college is on what you do and don’t use for your portfolio and what counts as being published I’m not going to take that chance. Though I will try to put some other short stories and things up as I decide that they are not good enough for my portfolio, and you guys can all slate the bajaysus out of them and help me to become a better writer! However, now I stand a new challenge; as my short story seems to be taking considerably less time than I had originally thought, I need to decide on what novel I want to work on next. I have a few ideas in mind, one werewolf, one vampire, one mythical and one dystopian. Each of these is as little planned out as the other, I would seriously appreciate any help, PLEASE comment on what you think I should write, I would really love to hear what you all think! Thank you!! Goals and Achievements Here I Come! So after deciding to start back into my Blog today, it is literally all I have been able to think about since. I know, that is incredibly sad and at 20 years old I should really have more on my mind, but in fairness work today was dragged out hugely so all I had time to do was think. I was also meant to start writing today, but got side tracked because when I got home my Step Dad asked me to help him do up a flyer for his counselling service. Obviously, I was gonna help him out. However, I still want to do something, so I’m going to draw out a Writing Map, and map out my progress for this month, what I hope to achieve in this one month and what I actually achieve. Of course what you want to achieve and will actually achieve are two completely different things. I always under estimate myself to make sure that I hit an actual goal, though this isn’t always the best method because I get lazy and stick to the smaller goal when I can be reaching much higher. Though, now that I am seriously trying to apply myself, and as there is an actual deadline for the applications for the masters I’m interested in I really have to be serious about my writing and stop slacking off and just forgetting about what I’m meant to be doing. I’ll have my map done out before the end of the day, and then I’ll know exactly where I’ll be starting with my writing over the next week. I have a few side projects at the moment, some I can talk about and some I can’t, but they will also be keeping me busy both in the lead up to and during my next year of college. Between all of this I am just after moving out with my friend, Samantha. It is going to be one amazing, hectic year! I don’t know if any of you remember me, but I have a few posts on this site and a few people who used to read my stuff and comment on my Blog! I know I have’t posted all summer, but I swear there’s a good reason! Well.. If you count having no real internet at all as a reason. Also, I was trying a new Blog out which didn’t work out because I missed talking to the people I had already met here! So, I am coming back to this Blog, with my tail between my legs knowing I was terribly wrong to leave you. I’m sorry, and I promise I will never do anything like that again! I’m going to start a few newer posts of a different nature than they were before the summer on this Blog, however I do still want to update about writing and all that jazz. I am starting back at writing tomorrow as I only have 7 months to get my portfolio together for the Creative Writing Masters I want to get into! So some serious writing needs to be done! Though, as I said, I have a few ideas to spice this Blog up and to get back into writing in it daily! Let’s hope this goes well people! So I met the family, managing not to kill anyone, spill anything or walk into anyone. That right there is success people. I just ate a pizza and burnt my mouth to a crisp, but it’s all ok people! You know why? I have popcorn. Not just any popcorn, but CHEESY popcorn. And Puzzle Pirates. Yes, I am still going on about this. I have been addicted to this little game ever since I wrote this little post here. I know this is quite a random post, but hey, that’s what happens when I don’t have much to tell you about. 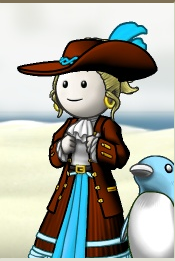 I don’t look like this in real life, and I don’t have a penguin either. But just think of the fun you could have as a pirate like this! I swear I’ll write something interesting soon!